Many times we are asked as Christians, “What do you Believe?”, given a situation either you or they maybe facing. Sometimes even, it seems that our answers are arbitrary or random simply due to us, if for no reason other than, having not been faced with that particular situation before. We could say that our response to those situations is “conditional” based on circumstances and who is involved, another interesting thought on how we share things with others on our Belief’s. This is where it becomes of the UTMOST importance to remember that the Holy Spirit has a work to do that we have no ability to accomplish inside of another person. We can show them in our lives how we have been gloriously changed, share with a person what made the difference in us and describe what we Believe. Faith is of Jesus Christ’s payment, which is for each person on their own, to place their Trust and Faith in for Salvation, and choose to Believe. It is a matter of Trust, not seeing. Jesus Alone is Able to Remove Our Sin and Restore Us to God. It is Jesus Alone Who has made that possible, for which NONE of us alive today were there to see Him be born, live, die on the cross and rise again. 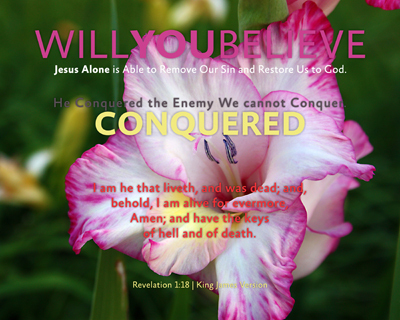 He was able to Conquer an Enemy that we cannot on our own. Indeed, He is the Great I Am – that Liveth, for He did Die for our Sins and is Alive FOREVER, making it possible for us to be Born Again – those that choose to Believe. There are fourteen (14) words in which we can draw specific items to remind ourselves as Christians or show others we are being a witness to of what we Believe. Each of us have the opportunity to share what we Believe and the obligation to show others how they can come to Believe. This Series is designed to give us an easy to share and show guide of what we Believe. I’ve been personally challenged by this Series through both discovery and study to better know what I Believe such that it shows through what I do, how I do it and that I am doing them. Our walk will put proof to our talk every time – it is my desire for others to come to the Saving Knowledge of Christ because of living what I Believe and their wanting to have in them what allows me to do so! Others Destiny hangs in the balance of Eternity, will we be telling them about Heaven and Hell and what our Heavenly Father was willing to give to make it possible for us to be Saved? 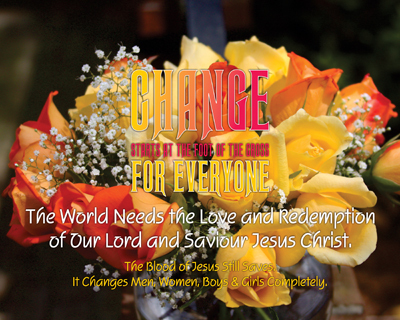 The World Needs the Love and Redemption of Our Lord and Savior Jesus Christ. The Blood of Jesus Still Saves. It Changes Men, Women, Boys & Girls Completely. 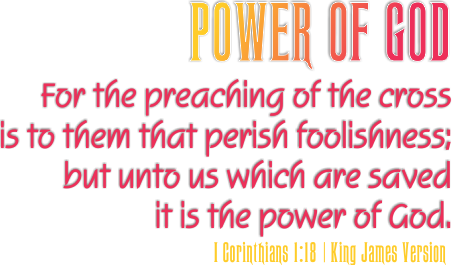 Are we doing what we have been commanded to do, in presenting the Gospel to others in the manner in which our Heavenly Father has gifted and equipped us to be doing? We’ve each been changed as Believers and make Declaration of that Change by exercising our Faith, but what about those who see us each and every day? Do they see a difference in us, other than, of course, dressing up and heading to church on Sunday morning? Evenings when we can… Wednesdays when we feel like it or a “special speaker” has been announced who interests us? Can others see, smell, touch, and feel the manner and impact of the Cross in our lives? Is it possible to show how the Cross has Changed us? The idea of a CC in an e-mail is to “carbon copy” another person in on the EXACT same material as one is sending to the primary e-mail recipient. The original person who is intended to receive the e-mail can easily see who “else” got the “memo” for whatever is being sent in that specific e-mail. Different in that of the BCC, which is a Blind Carbon Copy that the intended recipient cannot tell who they might be, is that everyone knows who the person(s) is/are. This example is used to express the concept because Salvation is provided for us to be “like” Christ – a mirror image which we have expressed to us in the Bible, through Holy Spirit Guidance and the Heavenly Fathers Provision. In essence we have a perfect CC’d message to God the Father, as when we accept Jesus as our Saviour, we get added to the Lamb’s Book of Life and EVERYONE can know it! As this is the most important change of a Christian’s life, we should WANT to let others know how they can be afforded the same opportunity, right? We have Peace – we do want others to know Peace, right? We have Joy – we do want others to experience Joy in their lives, right? We have Love, one for another – we do have the desire that others know what real Love is, right? The Cross depicts the Best Love Story of the Ages, Jesus Christ giving His Life for all who would EVER exist, so that we could be Changed and Melded into the Image of the Father. The following list contains eight (8) areas in which Jesus shows us through God’s Holy Word that the Cross is where Forgiveness, Redemption and Salvation are found. In a day and time where folks are willing to try anything to achieve view they want others to have of them, it is difficult at times to differentiate between what is being shown off and what is real Salvation experience. It is my desire for people to clearly see that I’ve been CC’d in every aspect of my life – from my family, coworkers, friends, peers, those that have authority over me… all the way to folks that I’ve got influence, whether that be direct or indirectly. My desire is that others, even without knowing the what, why, where, when and how, KNOW that I’m a Christian because of my continued submission to the emulation of Christ in my life. When I speak, those words should be lovingly shared, such that they have a drawing factor to them, pointing to the Cross. Where I go, should be without reproach, to those who are watching, inquisitive and even when they have the desire to ensnare – the Cross in my life should well visible. How I compose myself, must be reflective of what the Holy Spirit is projecting in me – as the Cross must be visible in service. My Salvation is a Cross matter, for the One who Provided me with the Choice, GAVE His LIFE to provide it for me. I want others to see my CC’d life is different, desirable and attainable – not through me, rather through the Person Who Died on that Cross – and ROSE AGAIN, making it available to Absolutely Everyone. This INCREDIBLE Series began with a rather simple word: W•O•R•S•H•I•P. Seven letters that led to a discovery of more than just seven passages of Scripture, the eclipse of it is thirty-five (35) of them in all. With that basic layout of a plan, immediately began honing in on what each part of the puzzle would reveal. The seven (7) letters and phrases were simple and fundamental enough to build a framework around, but would/could it support something more, as to present a framework in which to truly build something that could be used as a tool and eventual Study. I have nothing against “Praise and Worship” in a Service at Church, but I do think that if that is all the Worship that you do – you are doing so at the peril of missing the best of the Christian Life in Christ – which is lived every moment of our lives. We have the GLORIOUS opportunity to LIVE in Christ – in our Daily Worship! The thought of routine comes to mind when using the word “daily”, which can produce a rut or a thinly focused appetite for the Christian, making our “quiet time” with the Lord a ritual. Having a devotional guide book, like the “Baptist Bread” for instance, is a great sound bite being delivered from the pen of a person who carves out a nugget for us to benefit from – but that still is NOT what I am referring to in my daily Worship. For each person it will be different, but as for me – Praise and Worship is an ongoing process that goes from getting up to going down. Now here is WHAT I am talking about – do you WORSHIP your Heavenly Father in what you do on a daily basis? When we petition Him for anything, that is an act of Worship, Submission, Humility and Trust? Will you and I both WAIT upon Him to Answer us? How good are we at following instructions? When we do, it Pleases Him. How about us presenting ourselves for His use, even when it is NOT popular or favored by others? By doing so, we are offering our lives as a Living Sacrifice for His Use. Do you sing? Who hears you? Do we “know” Him like we should? By spending time in God’s Word each of us will get to know Him better. As our prayer time advances from more simple child-like prayers, they can develop feet to them – where we are allowed to see how our taking the time to sow the seed made the difference in the Eternal Destination they can choose to accept. Do we want others to have a personal, “intimate” relationship with the Saviour? If we don’t have the desire for others to be close to Him, then we have a problem – a REALLY big one: that we are NOT intimate with Him. How are we to be about “Pleasing Him” in our daily lives? A part of that answer is presented in this Series, but looking into God’s Word to find that answer – not in man’s idea of pleasing oneself. As a new “Christian” – a born-again, redeemed, saved, forever secure Child of God – each of these things will most likely be VERY new. To the more mature “Christian” – the Believer who has seen mercy, forgiveness, humbling, grace – each of these things will stir up in you a recall of events gone by. How many of them do we find ourselves doing regularly? The VERY first Worship item in this Series is “Wait Upon The Lord”, possibly the most difficult thing for me to do personally. Each of them have an element of difficulty associated with them, as each challenge us to do more for our Lord than what we may be doing currently. Another one that is a challenge for me is “Rest In His Presence”, for I want to DO, GO, BE, ACCOMPLISH… right now! The notion of “standing still” is like asking a bug in hot ashes to stop moving – but I’ve found a way to do just that when Thanking Him roles off of my heart, onto my lips and reflection takes place as to how Good He has been to me. Will you consider examining the way you Worship the One and True God of All Creation? Truly, have we considered our entire realm of Worshiping, not just the allotted time taken on Sunday’s to do so? 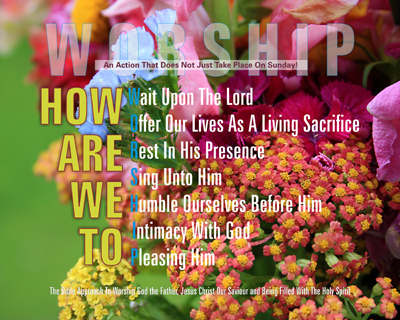 Or might we have desire to say that Worship is “An Action That Does Not Just Take Place On Sunday!” for each of us?